It's definitely summer here now, and if you're looking for something seasonally-appropriate to knit, you need look no further than the latest issue of Knit Now magazine (issue 91), which is available in shops now. I have a new pattern in the issue: the Sugarcube cowl. As summer turns to autumn I find myself wanting a lightweight additional layer: cowls are my favourite solution. The Sugarcube cowl is knitted in Hayfield Sundance* (50% acrylic, 50% cotton; 320 m per 100 g ball), a DK weight yarn with a high cotton content, which gives the yarn a really cool, crisp feel when you're working with it, and a lovely drape once it's knitted. The cowl can be made either short or long (to be wrapped round the neck twice) to add a little extra warmth without resorting to a coat, or to provide a little protection from the sun. The stitch pattern uses just knit and purl stitches with a 10 st, 20 row repeat, that is pretty intuitive once you've done the first repeat or two, making this a good project to work on when knitting with friends or chatting over coffee. The stitch pattern is fully reversible, so the inside of the cowl is as attractive as the outside. The cowl pattern is written in six sizes: S (M, L) for each of the short and long cowls. 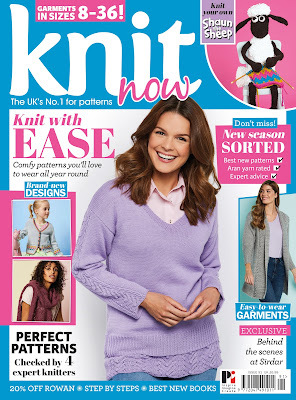 Knit Now issue 91 is available now from newsagents and supermarkets in the UK, or you can order a copy from More Mags. *Affiliate link. The cowl is shown in shade 504 Aqua Mist. All images copyright Practical Publishing.